SMTD holds a unique position as a top ranked performing arts program at the country’s number one public research university. Here you will receive one-on-one training with educators who are also working artists and researchers at the top of their fields. Founded with the belief that chamber music offers today’s musicians the most vibrant avenue of creative expression, along with abundant entrepreneurial career opportunities, the department empowers students to define and expand their own conceptions of artistic excellence and to stretch the boundaries of what classical music can and should be. The Department of Composition comprises a distinguished faculty of internationally-known composers who empower, guide, and encourage students to develop their individual voices and to realize their creative goals. Students work at the highest technical and artistic levels, creating pieces that explore a wide range of media and styles. One of the nation’s most highly-ranked and esteemed graduate conducting programs, the MM and DMA degree programs offer students the opportunity to study band/wind, choral, and orchestral conducting in a challenging, collaborative, and engaging environment. Mentored by world-class conductors, students gain first-hand experience leading a wide-range of ensembles. Dance at the University of Michigan offers a winning combination: a world class dance education within a leading research university. An extraordinary breadth of resources enables our students to bridge knowledge across disciplines and communities, and to gain an understanding of dance as a significant mode of inquiry. 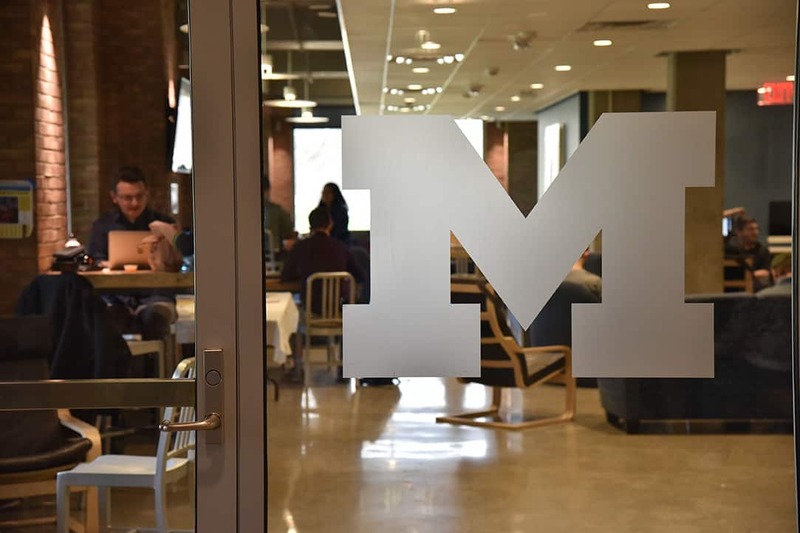 The Department of Entrepreneurship & Leadership provides diverse training and resources for all U-M students, and particularly those invested in becoming the arts leaders of tomorrow. Offering multiple points of entry, from co-curricular resources to single-credit courses and certificate and minor programs, students can engage with a variety of topics across the spectrum of arts entrepreneurship and leadership studies, while honing practical skills and knowledge that will amplify their artistry. Whether focused on individual career development, starting a new venture, or innovating within organizations, the Department offers a customizable academic foundation upon which students will learn how to transform their ideas into action. A world-class faculty provide rigorous training in mainstream jazz as well as the systematic exploration of more open, eclectic forms of improvisation. The department combines traditional and innovative coursework, cultivating an unsurpassed level of creativity, resulting in the development of skills that are key to success. A national leader in music education, the department is home to degree programs of extraordinary quality and diversity, and one of the top PhD programs in the world. The department is dedicated to providing future music educators with the necessary knowledge, skills, and insights for successful teaching and learning. Distinguished by the range of achievement in scholarship, and by the broad diversity of approaches fostered in research and in teaching, a guiding principle of the department is that music theory does not stand alone as a specialty, but is integrated with both other musical and extra-musical disciplines. The department is rich in resources to prepare gifted musicians for professional careers as organists, church musicians, harpsichordists and carillonneurs. Well-rounded career preparation includes development of artistry, technique, scholarly research, and the ability to play music of all periods with integrity, as well as knowledge of specific performance practices. 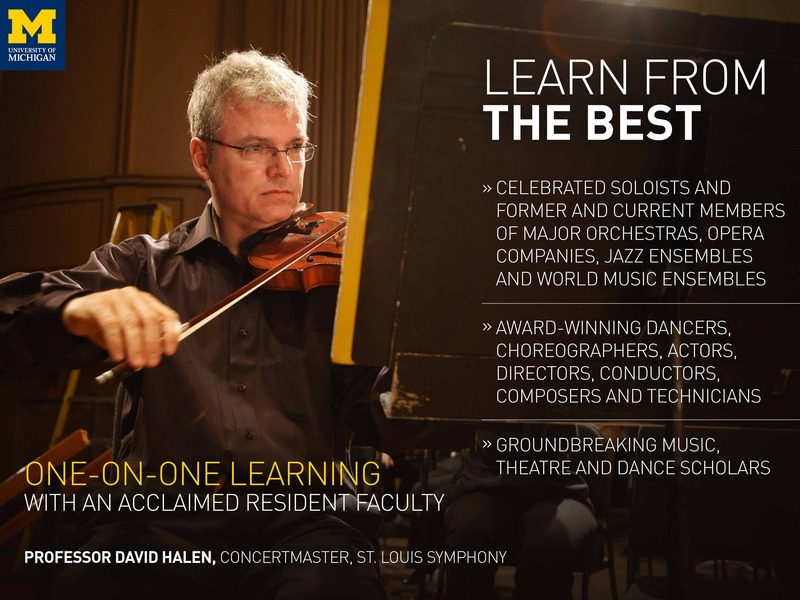 The department offers comprehensive professional training taught by a faculty comprising distinguished musicians and devoted teachers who expertly guide and encourage students to achieve their greatest potential. 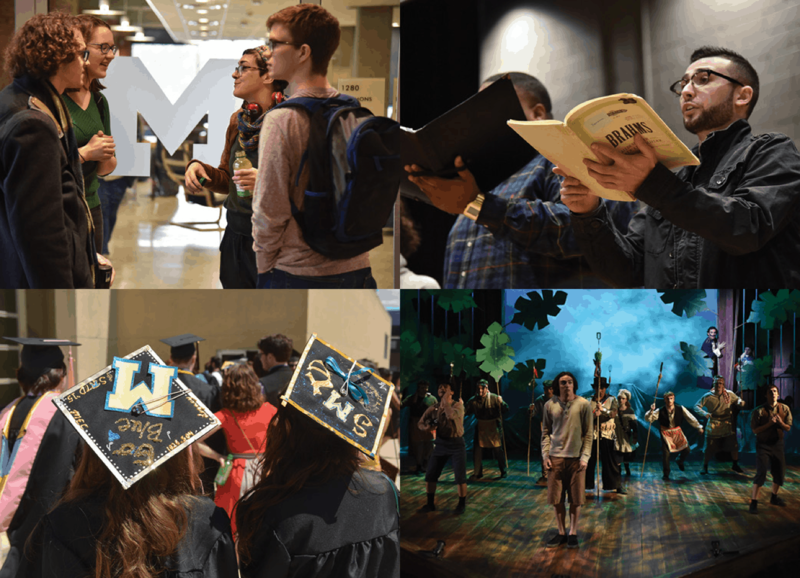 Performances and interdisciplinary collaborative opportunities abound, Fellow students are smart, focused, and supportive, creating a rich environment for artistic growth and creative thought. The department’s esteemed faculty champions an individualized approach to help each student fulfill their highest artistic and intellectual potential. A variety of graduate and undergraduate degree programs allow string players to choose a path best suited for their unique individual academic and musical goals, through private instruction, ensemble coaching, musicianship classes, and entrepreneurial training. 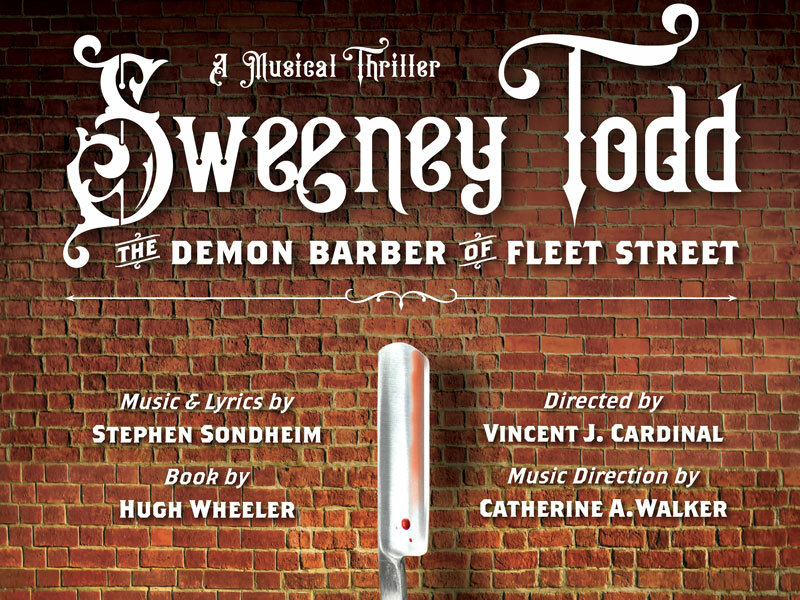 The department provides an unequalled opportunity for singers to discover, explore, and develop their passions. They receive a full-faceted education featuring individual training with a distinguished resident faculty, the flexibility to explore a wide range of musical traditions, ample performance opportunities, and a curriculum designed for the 21st century marketplace. Collaboration is at the heart of the wind & percussion, which features exceptional dedication and a personal approach from the acclaimed faculty. 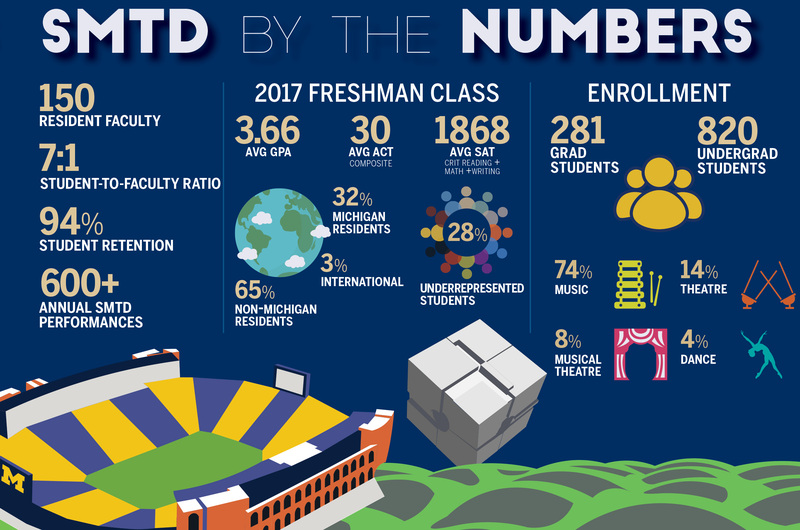 A fully-integrated environment allows students to thrive and participate in numerous ensembles across a variety of genres, and engage in vast interdisciplinary opportunities at SMTD and across U-M.